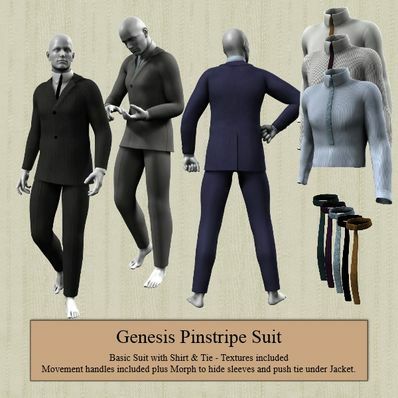 A Pin Stripe Suit for Genesis for use in Daz Studio 4.6. Several textures included. Mocement handles to help with posing plus morph to hide sleeves and to push tie inside Jacket. Thanks. I was hoping to find one this good!! Perfect! I can always count on you for those practical, everyday outfits when needed. Thank you once again! Love the suits, great work. Thak you so much for this! This is great, and I'll get a lot of use from it! Cheers!